So I’ll leave yesterday’s recap and the general malaise I’m feeling about the Yankees (the losses, the injuries, the strikeouts, the bullpen) to Erik Boland of Newsday. Yes, I know it’ll get better, but right now the team is not firing on all cylinders and it shows. If the losing continues, will Aaron Boone last the season? Musing on that…. The Yankees squander an early 5-0 lead and waste a bases-loaded, none-out threat in the 12th. As ugly as it gets. 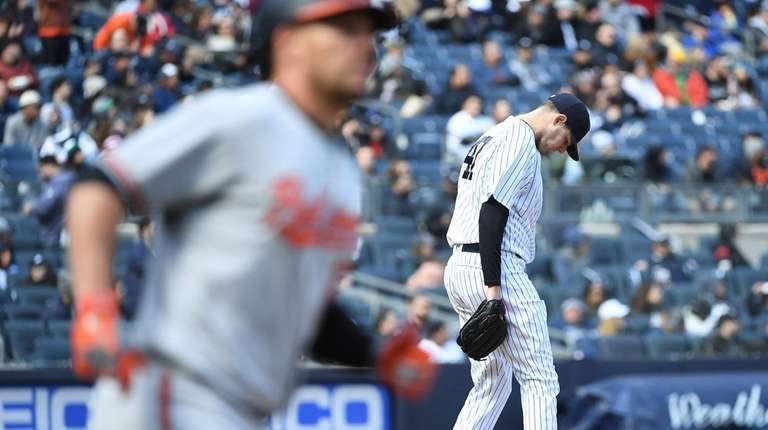 On a day when they scored five runs in knocking out the opposing starting pitcher after two-thirds of an inning, the Yankees fell to the Orioles, 8-7, in 12 innings at the Stadium — and failed to score after loading the bases with none out in their final at-bat. Bearing the brunt of the frustration from what was left of the thoroughly iced crowd of 37,096 — the wind-chill by the end of the 4-hour, 48-minute game was 32 degrees — was Giancarlo Stanton, who endured another nightmare day at his new home ballpark. Stanton went 0-for-7 with five strikeouts, his second five-strikeout game in the last six. The final one came with runners on first and second in the bottom of the 12th after Aaron Judge grounded into a 1-2-5 double play to short-circuit the rally. Stanton personally stranded nine runners and the Yankees left 14 on base as a team. “They’re not going to cheer for that, so what do you expect?” Stanton said of the booing he heard all of Sunday and most of the homestand, one he finished 3-for-28 with 16 strikeouts. It was not the way the Yankees (5-5) — who dropped three of four to the Orioles (4-6), including a 14-inning loss in the second game of the series — wanted to hit the road for their first 2018 series against the AL East-leading Red Sox (8-1). The Orioles scored off Adam Warren (0-1) in the 12th. With one out, Pedro Alvarez pinch hit for Danny Valencia and drew a walk. After Warren struck out Tim Beckham, Anthony Santander singled and Craig Gentry won an 11-pitch at-bat, bouncing a single to left to make it 8-7. Orioles righthander Brad Brach somehow worked out of a massive jam in the bottom of the 12th in earning his second save. Austin Romine, who had three two-out RBI singles, and Didi Gregorius led off with walks against Brach. When Brett Gardner’s two-strike sacrifice bunt was booted by Brach, the Yankees had the bases loaded, but Judge hit a comebacker on an 0-and-1 splitter that Brach turned into a double play and Stanton struck out on four pitches. Lost a bit in Stanton’s bad day and the overall odd afternoon was Jordan Montgomery’s failure to hold the 5-0 lead he was given before throwing a pitch. He was pulled with one out in the fifth after Valencia made it 5-4 with a two-run homer to deep left-center on an 0-and-2 pitch. It was the Orioles’ 10th hit off Montgomery. He still did far better than his counterpart, Baltimore righthander Mike Wright Jr., who allowed five runs (two earned) and five hits in two-thirds of an inning, including a two-run single by Miguel Andujar and an RBI double off the leftfield wall by Ronald Torreyes. Santander’s two-out, two-run homer on a 3-and-0 pitch from Domingo German gave the Orioles a 7-6 lead in the seventh, but Romine’s single tied it in the bottom of the inning. Who scores a gazillion runs per game? Against tough division rivals yet? The 2017 Yankees do – and did. They destroyed the Orioles this weekend with an offensive barrage the likes of which we haven’t seen since the guys in the photo above. Instead of them, insert Judge, Sanchez, Hicks and Castro. And throw in Holliday and Didi too. But what’s truly astonishing about this team is they’re not just homer happy. Not that I don’t love homers, especially at the Stadium where the warm weather and inviting short porch are a tonic for the players. It’s that they can also score runs by taking their walks, hitting singles and doubles, stealing a base – the complete package. Judge, in particular, is so impressive that I ordered a Judge jersey from the Yankees store today, hoping I wouldn’t jinx him. Once again, the starting pitching has been surprisingly good. Chad Green, taking Tanaka’s spot in the rotation today, wasn’t sharp and I have no idea if he’ll stick around, but the rest of them have been superb. Can this team power through in first place until and after the All-Star break? Who knows, but I’m enjoying the ride in the meantime. Who wouldn’t? P.S. Audrey just sent me pics of her Judge sugar cookies. They’re brilliant and look so delicious. I, for one, would love a batch. And Audrey, you could sell $$$ of them at the Stadium! It would have been sweet if the Yankees had won their last game of the season and Teixeira’s last game as a professional baseball player, but it wasn’t to be. The Orioles got the better of us in terms of the score. Tex, however, had a lovely farewell from the Steinbrenners, his teammates and coaches and the fans. 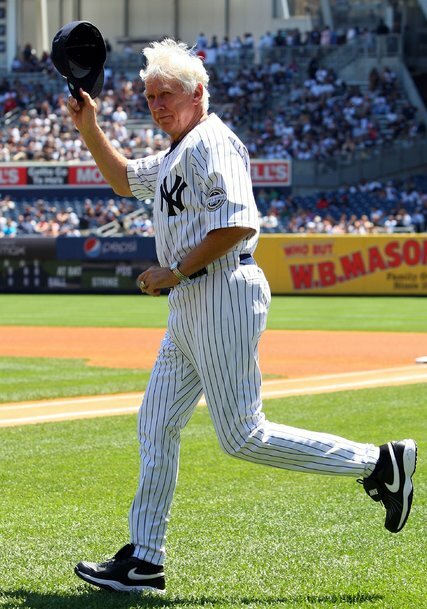 I’ll try to remember his earlier years in pinstripes when he was so productive at the plate and so skillful at first base, not the most recent years when he was injured so often. In any case, it’s on to the playoffs for several teams while the Yankees braintrust figures out how to craft a winning team for the future. It’ll be interesting to see what, if any, moves are made in the off-season and I’ll certainly blog about any newsworthy events in Yankeeville. But for the most part, I guess I’ll be putting “Confessions” on hiatus. Feel free to stop by with any comments and I’ll be sure to respond and, as I said, check back after news breaks and I’ll weigh in. Meanwhile, have a healthy and happy off-season! Even though the Yankees played great against the Red Sox, they were knocked out of the postseason for real tonight. How to evaluate…. Not enough offense. The team just didn’t score runs. Period. Yes, Cashman sent our key bullpen guys to contenders, but, relievers aside, the hitters just didn’t hit. It’s sad to be left out of the postseason and I’d rather not make a habit of it, but it’s not a shock. The 2016 Yanks didn’t have the talent or the talent didn’t perform up to potential. Will the kids turn us into winners next year? Probably not without the addition of key players. But they were the bright spot in an otherwise dreary season. Just the thought of Gary Sanchez makes me smile. So it’s time to finish up against the Orioles this weekend and wait to see who plays whom in the playoffs. I usually root for the Dodgers if the Yankees are out of it, but this year? The Cubbies have to be the sentimental favorite.